Options Chewable Tablets - 250 mg - 60 ct. Chewable Tablets - 500mg - 60 ct.
Seizures, which can occur in dogs for many reasons, can be a frightening ordeal for pet owners. When a dog is diagnosed with epilepsy, K-BroVet can help. 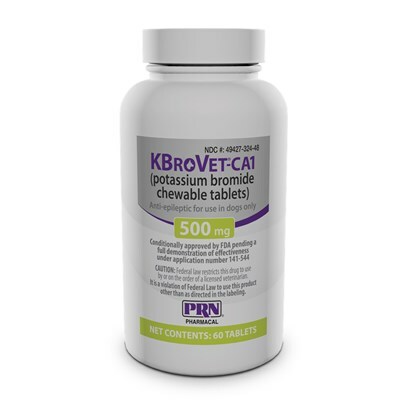 K-BroVet was developed to provide a reliable source of potassium bromide that can be dispensed in the clinic, a convenience for both the client and the veterinarian. Potassium bromide has long been recognized as an excellent anti-convulsive for the alleviation of canine seizure disorders and is often considered the first option for dogs with idiopathic epilepsy. K-BroVet has also been formulated with B vitamins to support healthy neurological function. K-BroVet can be used in conjunction with other therapies, including Phenobarbital, or alone, as the sole anti-convulsive. Unlike Phenobarbital, bromide is not a hepatotoxin, making it the treatment of choice for dogs with liver damage. Use caution with chloride-containing medications and foods. Potassium Bromide. Also contains cyanocobalamin and liver flavor. For a loading dose to achieve a serum level of approximately 1 mg/mL, give 120 mg/kg PO daily for 5 days and then reduce to 30 mg/kg PO once daily. To achieve a serum level of approximately 1.5 mg/ML, give 160 mg/kg PO for 5 days and then reduce to 40 mg/kg PO once daily thereafter.